Now everyone in Metro Manila can have their very own Kuya, a personal assistant ready to make daily life easier. 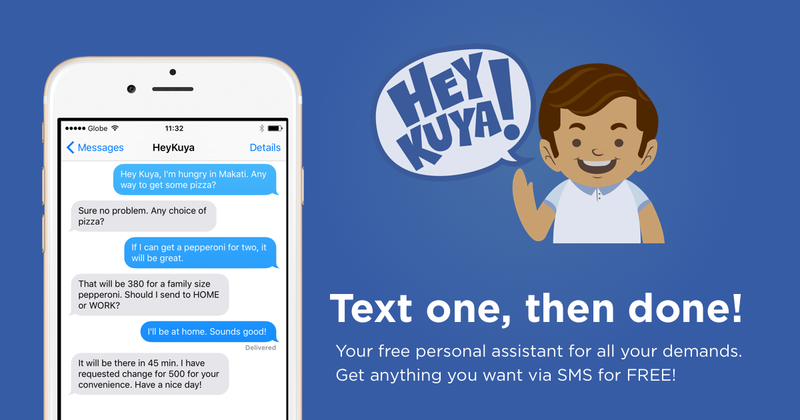 Users of HeyKuya, the latest company built by Machine Ventures, can avail of the hassle-free services, ranging from deliveries, reservations, bookings and many more without any hidden costs, simply through text. There are currently no membership fees and Kuya only charges for what you order. “Every day we help people across our city to book tables at the hottest restaurants, reserve movie tickets for the latest show, or even provide directions if they are lost and don’t have access to the internet, all for free” said Nathania Chua, Marketing Manager for HeyKuya. Despite the wide use of mobile devices in the Philippines, many are still not internet-savvy, or have to look for an area that offers a WiFi connection. This is where HeyKuya takes over by connecting through text messages, an affordable and reliable form of communication. HeyKuya is the latest innovation from Machine Ventures, an end-to-end company builder that transforms ideas into companies. Machine is backed by several of the region’s most prominent entrepreneurs who have launched successful startups across the globe.